On 12/18/2014, I was prescribed Levofloxacin 500mg BID for anosmia, caused by a sinus infection. The physician did not tell me of any contraindications nor any potential adverse side effects. When I picked up the prescription, I saw a tag attached to the pill bottle warning of exposure to sunlight. I also read the information sheet printed by the pharmacy, and noticed that there was a caution about possible tendon problems. As I was leaving the next week for a ski trip, I phoned the doctor to ask if this was an issue. He prescribed a different antibiotic (Amoxicillin 10 days), and said to wait on the Levofloxacin to use later if the first antibiotic did not eliminate the infection. After 4 days, the anosmia started clearing up, but reverted to the pre-antibiotic state a few days after completing the course of Amoxicillin. I called the doctor's office to confirm that I should next try the Levofloxacin, which I then started on 2/4/2015. On 2/12/2015, I had a sudden onset of the following symptoms: chest pains (left side) and swollen left knee with substantial pain. I notified the doctor, who told me to stop the Levofloxacin immediately, use ice and elevation to reduce swelling, and wait until the symptoms subsided to start the next course of antibiotics. I called him with an update on 2/17/2015, telling him that I was still in quite a bit of pain, and that my left knee was still very swollen. He prescribed Prednisone 5mg BID, and a 20-day course of Amoxicillin. He said he'd never had anyone experience such a severe reaction and told me to call him back in a week or so, to let him know if things were better, adding that he'd refer me to a Rheumatologist if I was still having symptoms. Today is 3/1/2015, and while the edema has lessened, the pain has not and I have significant left hip pain in addition to the continuing pain in my left knee and chest (left side). I have reported the adverse effects to the FDA. I have always been active, have no medical conditions that would impede my lifestyle, and am hopeful that all of this will soon be a thing of the past, but for now, it is quite frightening. each step. Dropped off information for Dr. B. to read, he called immediately and referred me to a Rheumatologist, saying it might be serum poisoning. He apologized for prescribing the drug that is causing so much pain and problems and said he’d be very happy to hear from me regularly with updates. Just before bed, my knee suddenly felt better for the first time. It seems to be less swollen and less painful. Was the sinus infection from a bacterial or a viral infection? Though it's a rare experience to have a doctor so readily admit tha tthe symptoms were caused by the Levaquin. And I don't think I've ever heard of a doctor apologizing. So if nothing else, I appreciate your doctor for doing those two things. So. Your body is suffering side effects of Levofloxacin, as you described. The important part, is WHY you're suffering side effects. 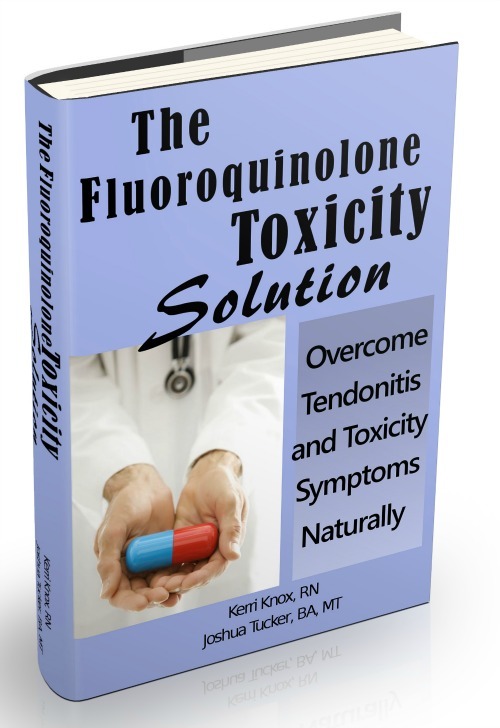 So you may want to look at what exactly fluoroquinolones do to the body. You're not suffering from Tendonitis per se, though you do have a Pain Causing Dynamic in play. See: What Is Tendonitis (Regular tendonitis). Fluoroquinolones like Cipro, Ciprofloxacin, Levaquin, Levofloxacin, etc, all have a similar mechanism, a primary aspect of which is that it depletes magnesium....and everything goes downhill from there. Levaquin Tendonitis and Cipro Tendonitis, as it's commonly called, consists of all sorts of symptoms including but definitely not limited to tendon pain. Muscle twitch/spasm, muscle pain, heart palpitations and various heart issues, anxiety and various flavors of that like insomnia/claustrophobia/etc, joint pain, etc, are all magnesium insufficiency syptoms.